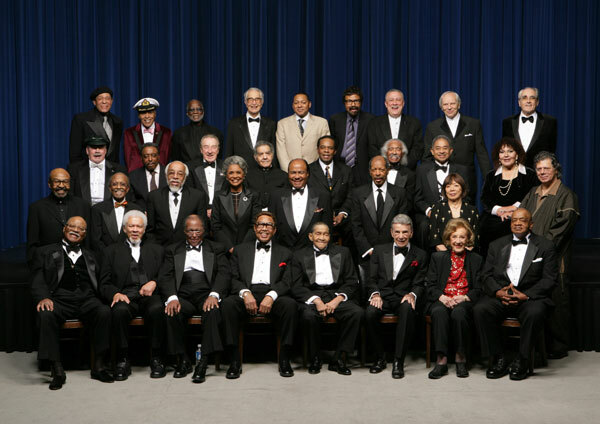 Legends Play 'Jazz In Our Time' In March 2007, more than 30 lifelong jazz musicians were celebrated at the Kennedy Center for their contributions to a unique art form. JazzSet presents a recording of the concert companion to the awards ceremony, featuring Dave Brubeck, Nancy Wilson, and more. Photographer John Abbott titled his group shot "A Great Day in Washington," an homage to "A Great Day in Harlem," the 1958 Art Kane shot of jazz artists together on a townhouse stoop. In March of last year, with an appreciative crowd filling the Concert Hall of the John F. Kennedy Center for the Performing Arts in Washington, D.C., more than 30 lifelong jazz musicians received some of the credit they'd long deserved. One by one, emcee James Earl Jones called them to the stage to thank them for creating a unique American art form. Together onstage, they made for one magnificent tableau. On this installment of JazzSet, Dee Dee Bridgewater hosts highlights from "Jazz in Our Time," the concert companion to the awards ceremony, with John Clayton as musical director. 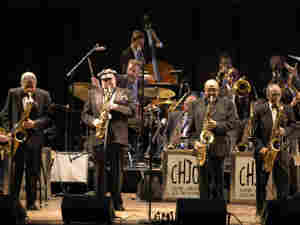 Following an All-Star Sextet and the duo of Dave Brubeck and Wynton Marsalis, the Clayton-Hamilton Jazz Orchestra (the unofficial house band of Jazz at the Kennedy Center) took the stage. A few lucky legends share the spotlight with the orchestra in this performance. From France, Michel Legrand is the Oscar-winning composer of the score to The Umbrellas of Cherbourg. He plays and briefly sings a selection from it here. Next, legend Nancy Wilson has big fun singing "Day In, Day Out." Then, she introduces four saxophone legends named Wess, Woods, Moody, and Heath for "The Eternal Triangle" by saxophonist Sonny Stitt. To close "Jazz in Our Time," Clayton wrote a thrilling new arrangement — featuring Dr. Billy Taylor on piano — of his Civil Rights anthem, "I Wish I Knew How It Would Feel to be Free." Taylor, the Morgan State Gospel Choir, Nancy Wilson, Regina Carter, and Jon Faddis join the Clayton-Hamilton Jazz Orchestra. This segment originally ran Jan. 17, 2008. Thanks to Kennedy Center vice president Darrell Ayres, director of jazz programming Kevin Struthers, program coordinator Jean Thill, announcer Paul Anthony, and the production team: Greg Hartman and Big Mo Recording with Mark Barrie; music mixer Duke Markos with Yujin Cha; recording engineer Ginger Bruner at KUNV, 91.5 FM, your jazz spot in Southern Nevada; producer Becca Pulliam; and executive producer Thurston Briscoe III.